Super Bowl: Facebook data show who's rooting for 49ers over Ravens. Facebook’s data science team dived into the social network’s data on NFL fandom and came back with some revealing findings. For one thing, pro football fans are shameless bandwagon-hoppers, especially during the playoffs. And it seems the bandwagon everyone’s hopping on right now is the one that belongs to the San Francisco 49ers. In a post that draws on what he calls “one of the most comprehensive samples of sports fanship ever collected,” Facebook data-science intern Sean Taylor analyzed patterns in the numbers of people who “like” the team pages of various NFL organizations, including the Super Bowl-bound 49ers and Baltimore Ravens. In all, some 35 million U.S.-based Facebook users—more than one in 10 Americans—have declared their support for at least one team. How does a given team accrue these “likes?” By winning, of course. But especially by winning in the playoffs. 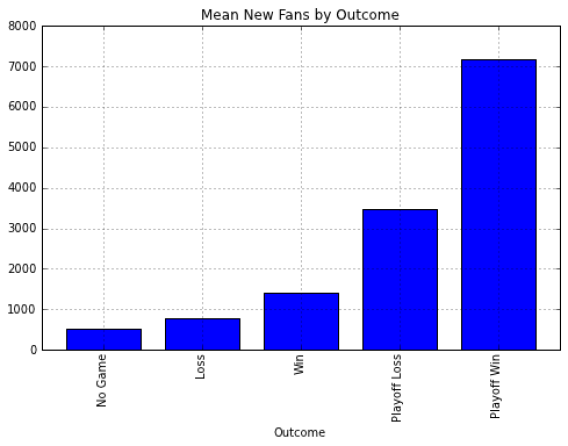 Facebook data show that a playoff win results in more than twice as many new “likes” as a playoff loss, and nearly five times as many as a regular-season win. In other words, an awful lot of Facebook users make their fandom official only once their team is in the national limelight. Facebook’s data also reveal which team commands the most fans in each county across the country (or, at any rate, the most fans eager to declare their allegiances on a social network). The first map shows the breakdown for all 32 NFL squads. The findings are mostly predictable—Tennesseans support their Titans, San Diegans back the Chargers—but there are some fascinating intricacies and anomalies. In Ohio, for instance, the Cleveland Browns and Cincinnati Bengals hold down their respective metropolitan areas, but lose out to the Pittsburgh Steelers across most of the rest of the state, including the capital. The mighty Steelers’ reach extends, incredibly, to pockets of Oregon, Nevada, Alabama, and Alaska, plus the entirety of Hawaii. The poor New York Jets, meanwhile, hold just a single county on Long Island. Perhaps even more ignominiously, the Oakland Raiders lose not only their own home county but the entire Bay Area to the more glamorous 49ers, though they make up for it by winning Los Angeles and a swath of Southern Oregon. And is that a patch of New York Giants territory in Central Florida? 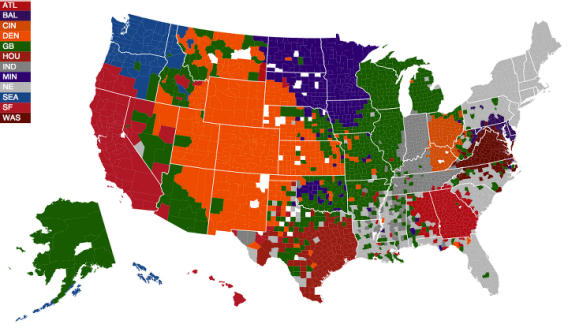 When limited to the 12 teams that made the playoffs this year, the map turned strikingly orange as the Denver Broncos gobbled up a bunch of Dallas Cowboys territory. 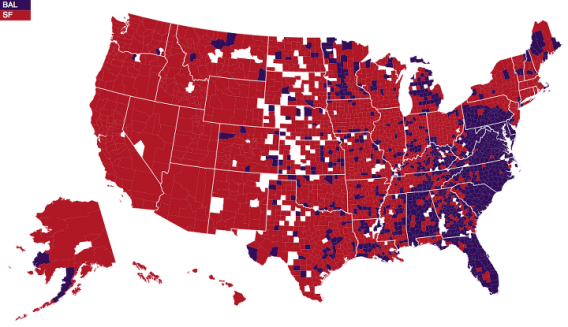 Of course, not all counties are created equal, and the Broncos’ contingent would surely be dwarfed by that of the New England Patriots’ in terms of actual population. 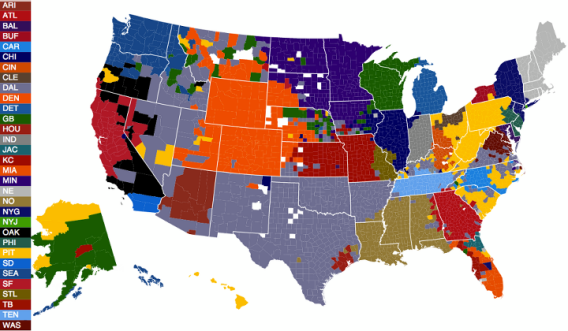 (Facebook did not release hard numbers of “likes” for each team, only the counties in which they held a plurality.) Alaska, meanwhile, veered hard for the Green Bay Packers, perhaps out of affinity for the tundra-like conditions of the team’s home turf. To see how the map shifted with each successive round, you’ll have to check out Facebook’s full post. The process reminded me a little bit of that epic Quora post about what would happen if every U.S. state declared war against the others. But the image at the top of this page shows what it looks like when you fast-forward to the Super Bowl. And no, it isn’t pretty for the Baltimore Ravens. Could that be because the 49ers are favored to win? Because they have a longer history of success? Because their team colors are prettier, or they have a stronger social-media presence? Any interesting observations that we neglected to mention? Let us know in the comments.